I have driven by Roundel Cafe many times, but haven’t really noticed it among all the other merchants by Hastings and Nanaimo. This area has easily become one of my main areas to enjoy great food- from Sushi Nanaimo, East Cafe, The Red Wagon, Basho, Platform 7, and many, many more that I look forward to trying! My friend and I planned to go here during the Easter weekend, but there was a really long wait so we decided to go to Basho. I came back here two weeks after, because I was really interested and wanted to see if they had good brunch. The Red Wagon is pretty much across the street from them, so they do have lots of competition because that place is really famous for their brunch. I wanted to see if they held up as a good brunch diner. It was a lot quieter when we went this time around, only about three other tables were seated. 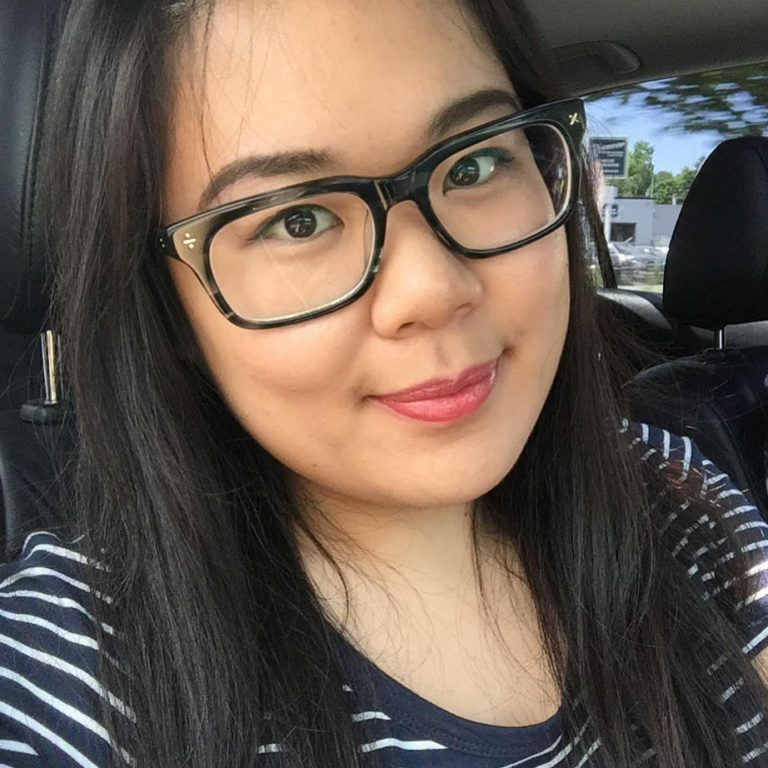 Service was very friendly, informative and efficient. We both had questions to ask about the menu, and our server happily answered them. I finally decided on ordering their corned beef hash, served with eggs and salad. I thought the beef was very flavourful and cooked well. It was also mixed with onions and peppers which gave it a sweeter flavour. Underneath the beef was the roasted potatoes. They served the usual white potatoes, but there was also a mix of sweet orange potatoes. I appreciated the mix, as the sweet potatoes were less starchy and dry. Some of the potatoes were really burnt though. 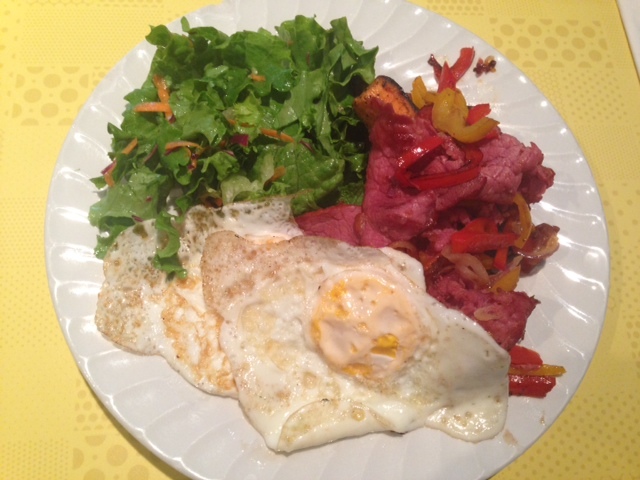 The salad and eggs were average, I think the star of this dish was the corned beef. 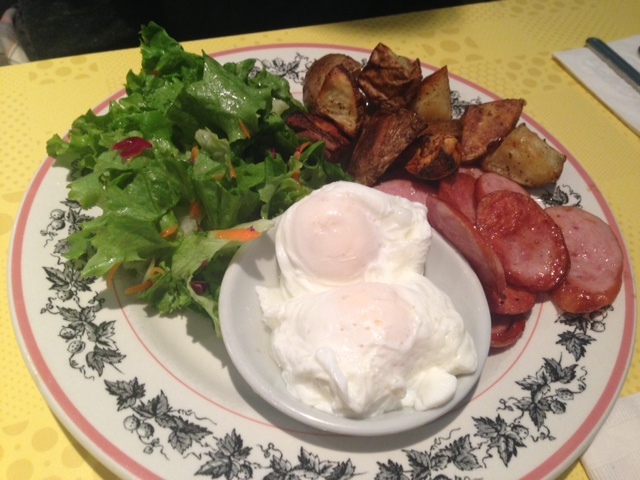 My friend ordered the free range eggs any style combo, which came with salad, roasted potatoes, and a choice of either ham/bacon/farmers sausage. She thought that her dish was really delicious, especially the farmers sausage which was very juicy and had a hint of smokiness to it. Her roasted potatoes were a bit burnt as well. 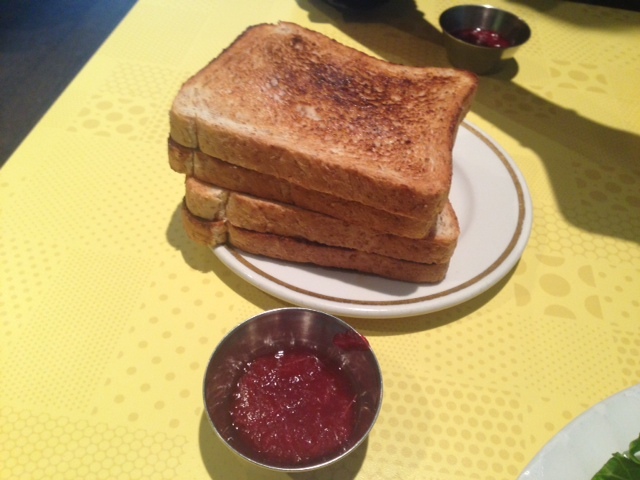 For both our dishes, you can request for toast if you’d like. Their jam is house made, and we both found it to be very tart and not sweet. It had a very strong rhubarb taste. We would have preferred a sweeter strawberry jam! 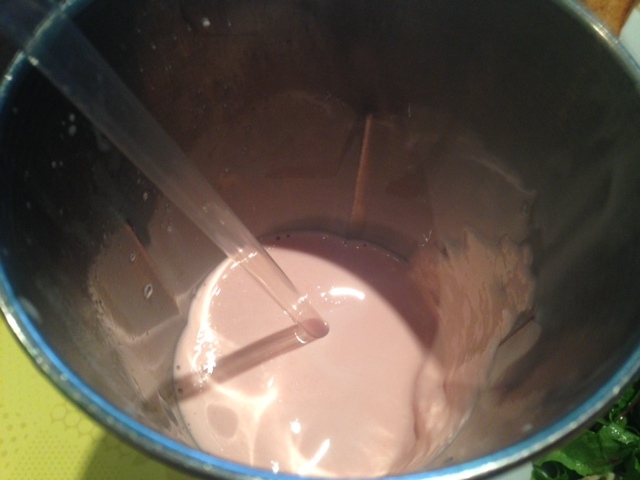 It was a lovely afternoon, and we decided to indulge in a strawberry ice cream milkshake! This was heavenly. It was smooth, rich, creamy, and thick. We also asked for soy milk since I didn’t want that much dairy, and she also did not charge us for that which was nice! 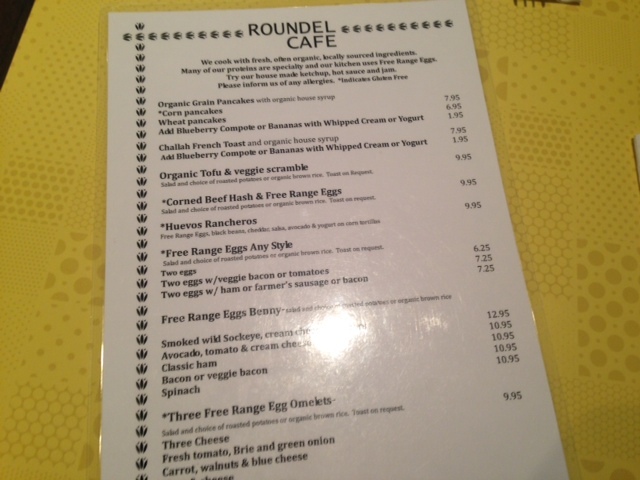 Overall, we had a satisfying and enjoyable visit to Roundel Cafe. Nothing really stands out to me, but it’s not bad either. I would come back if I was in the neighbourhood and it was convenient, but wouldn’t specifically plan another visit here. I’ve read some other reviews on Urbanspoon where people mentioned their pancakes weren’t that good, so if you are craving pancakes, I would suggest crossing the street to The Red Wagon. I apologize for the lack of restaurant reviews lately. My summer semester started a week ago, and the assignments are already piling up! The good news is that one of my courses will be done in half the normal time, since it’s an intersession course, so I will have a lot more time once it is over. But for now, I am swamped with course assignments, starting my application process for co-op, work, and trying to squeeze in a social life still. 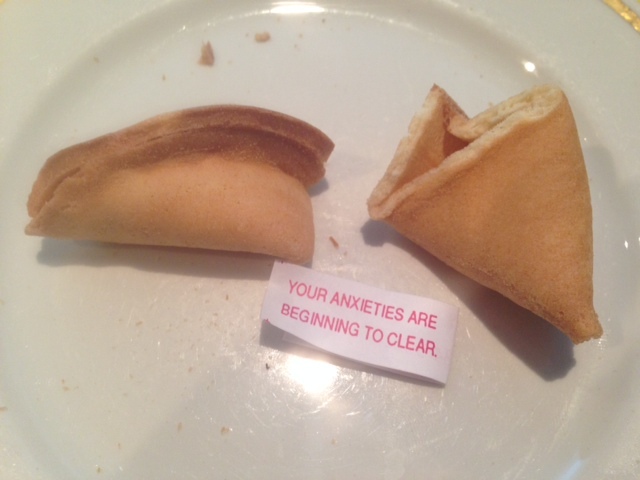 Hence, my attempt at squeezing in a social life results in this restaurant review. 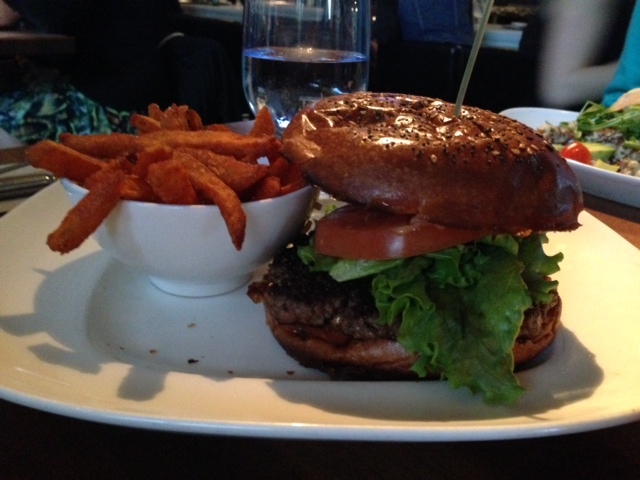 It was one of my childhood best friend’s birthday last week, so a small group of us converged over great food at Joey! 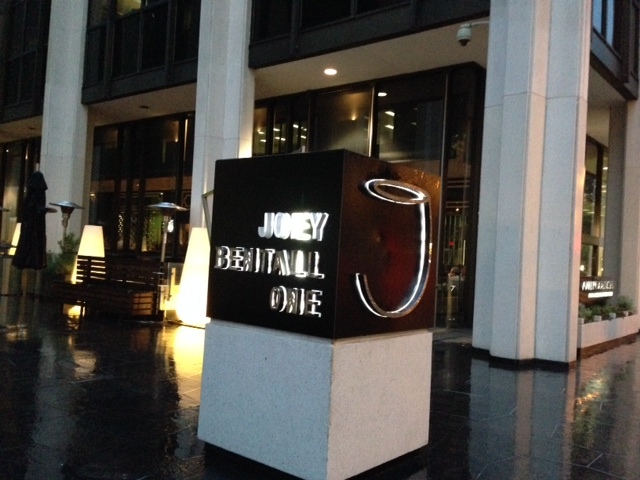 There are actually two JOEY restaurants on Burrard Street in downtown Vancouver. One is the actual JOEY Burrard, while the other is JOEY Bentall One. Bentall One is located a block away from Burrard skytrain. I was a bit confused at first since my friend told me it was the Burrard location, but when I got there, it said Bentall One. Thankfully, I was at the right location! As always, the decor and ambiance was very fancy and lively. There were a lot of professionals having drinks and appies at this location. Since I was running late due to my class, they decided to order an appy while waiting for me to arrive. 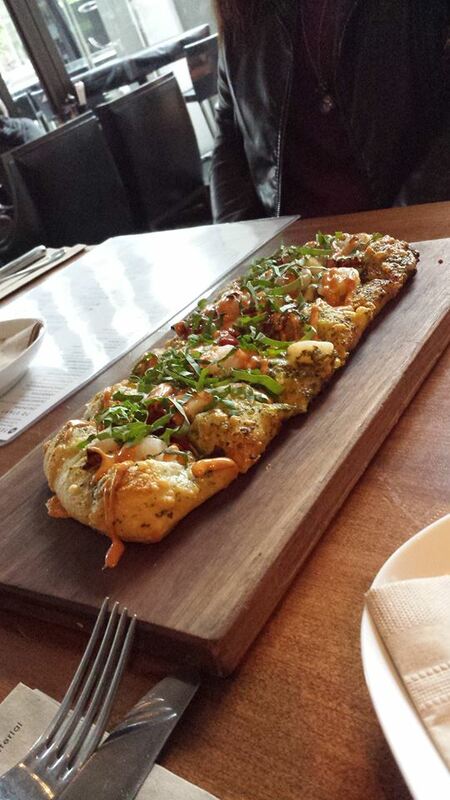 They were also nice enough to save me a piece of the pesto shrimp flatbread, $14.50. It was very doughy and loaded with a lot of ingredients on the top. They were also generous with the amount of shrimp. I was really considering ordering this as my main dish, but decided on getting something else. 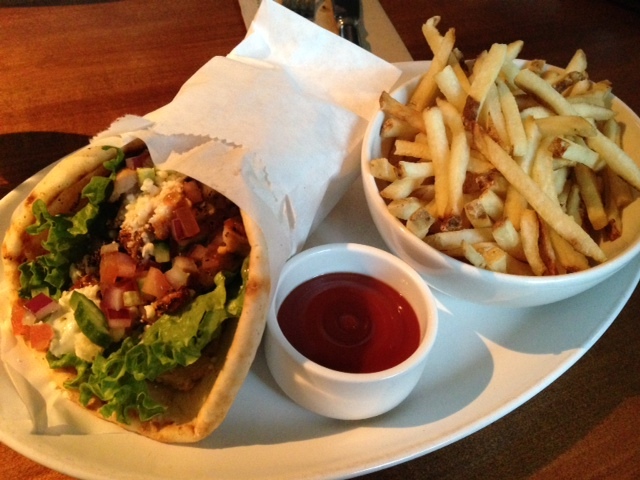 I ordered the chicken souvlaki served with skinny fries, $14.50. I was surprised when the dish came out, because I was expecting it to be on a bed of rice, with a chicken skewer. However, this wrap was really filling and delicious nonetheless. The chicken was grilled and had a hint of smokiness to it, while the other veggies and cheese inside tasted really fresh. The pita bread wrap was also very soft. 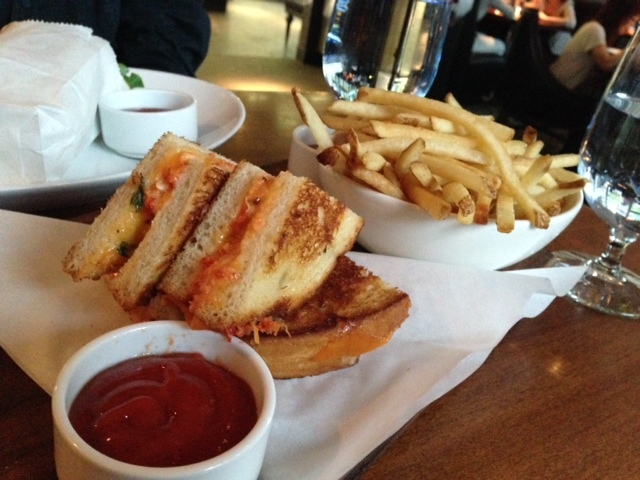 Friend’s lobster grilled cheese, with brie, cheddar, and and cocktail sauce $15. I had a bite of the sandwich, and really enjoyed the strong flavour of cheddar in it. The lobster was mixed inside with the warm cheddar and brie cheese. Some of these I didn’t get a chance to taste, so I will unfortunately just have to give you guys the name and price. 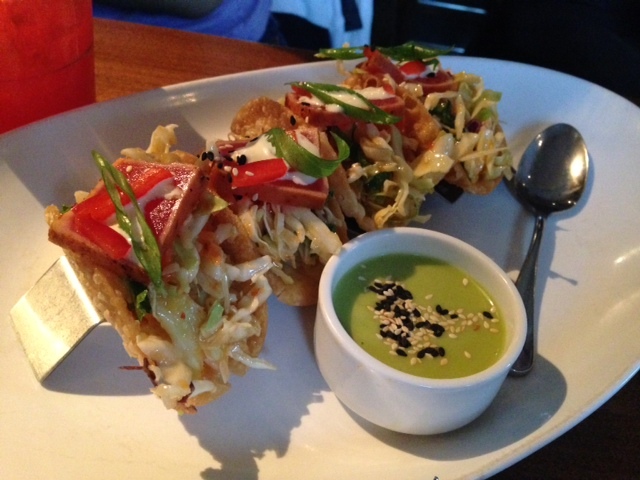 Ahi tuna tacos – $12. Bacon cheddar burger, sub yam fries $15.25. 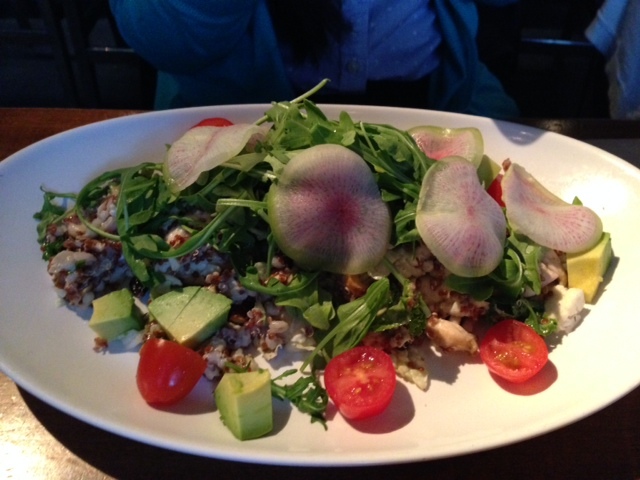 The 500 salad – organic quinoa, barley, watermelon radish, mint, tomatoes, avocado $13.50. If the birthday girl wants to indulge in dessert, she is allowed to. 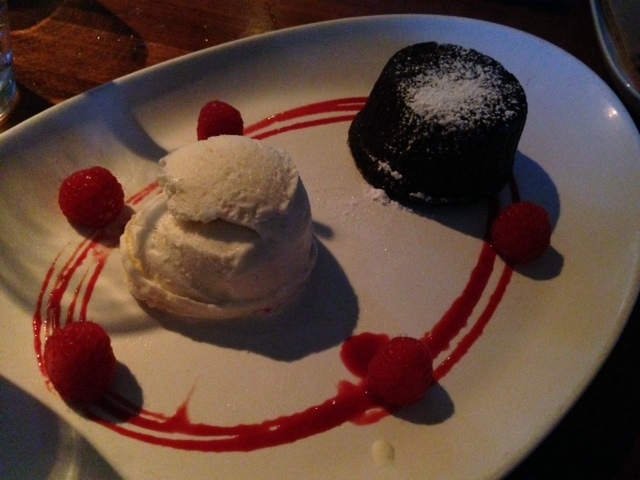 She decided to order the molten lava chocolate souffle, $8.25. Yes, it looks and sounds as good as it tastes! Thick, warm dark chocolate slowly oozes out of the molten lava cake after you dig in. The chocolate was very creamy and smooth. Paired with the raspberry sauce and vanilla ice cream, it is seriously a match made in heaven. 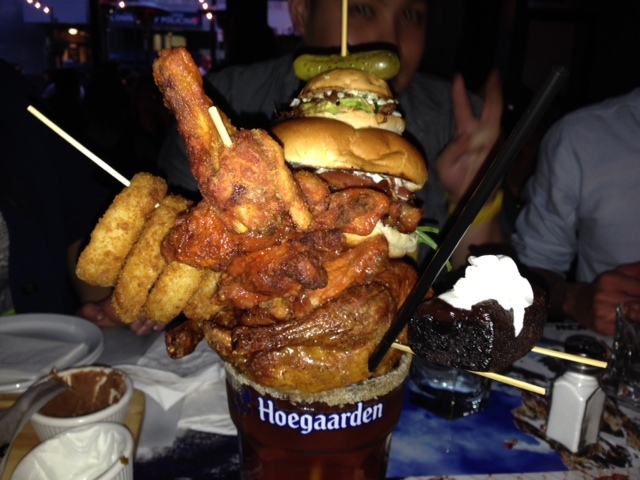 “checkmate” Caesar which is a Caesar topped with a whole chicken, burger, hot dog, brownie, and more! Although I love spice and tomato juice, I’ve never ordered Caesars because I prefer beer much more. After trying out Score on Davie, I think I will be ordering Caesars much more. Keep reading to see the much anticipated checkmate! 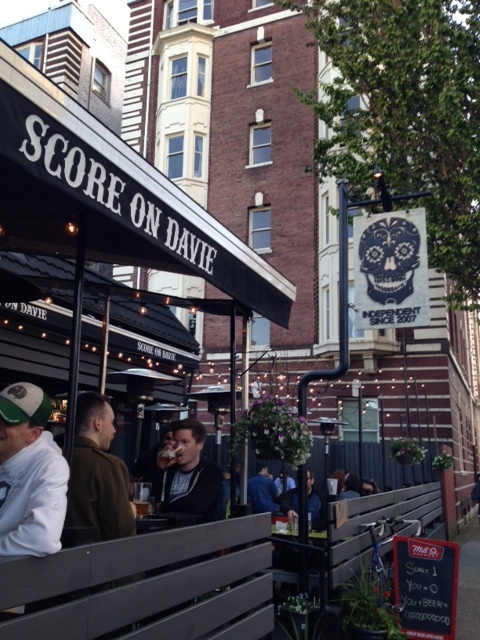 The place was packed by 8pm on a lovely Vancouver evening, and they were at overcapacity. They had “bouncers” but they were the nicest security I’ve ever come across. One thing I really liked about Score was their music. They had such good hip hop beats going all night long! This was their menu. 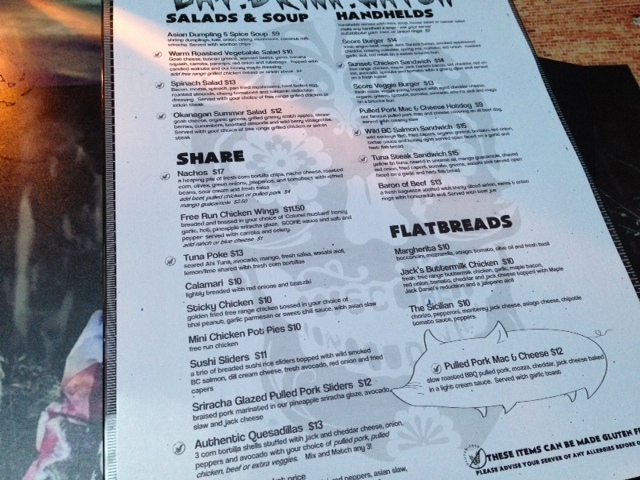 We decided on sharing a couple of food items, drinks, and of course, the checkmate. 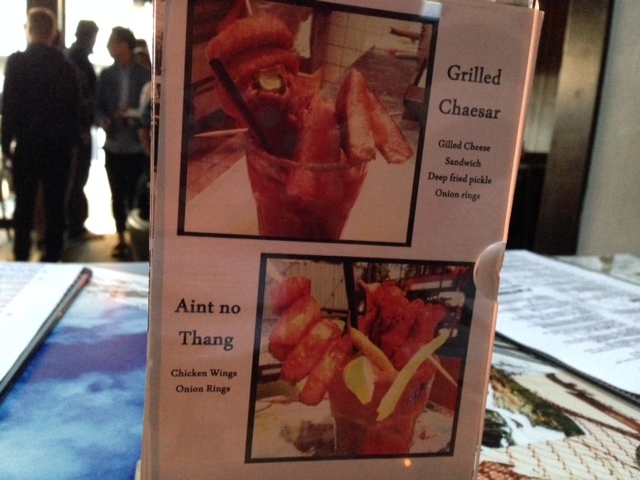 These are some of their other specialty Caesars as well. We thought that these were pretty impressive, but we did not know what the checkmate had in store for us… I should also mention that the checkmate is not on the menu, probably because it would annoy the hell out of the workers to make it if everyone knew about it. We had to ask our server for it! 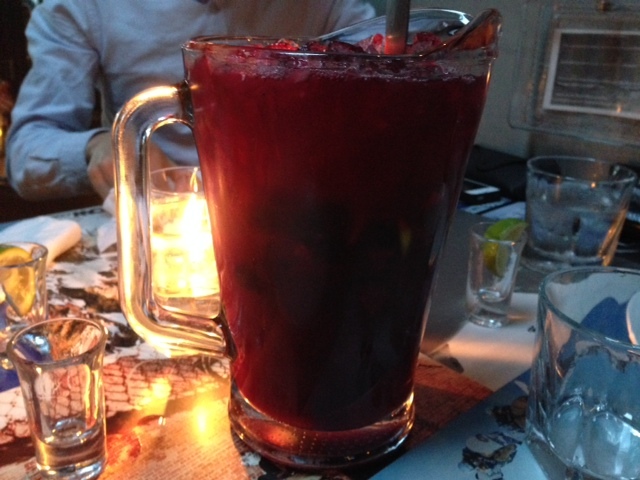 Some of my friends decided to share a pitcher of sangria ($25). You are given the option to chose between red or white wine, and it also comes with a big metal spoon to help with getting the frozen fruits easier. They really enjoyed the sangria. It was the perfect drink to enjoy on a sunny and beautiful Vancouver evening. I ordered the Mill St. Vanilla Porter ($4)! It was delicious. 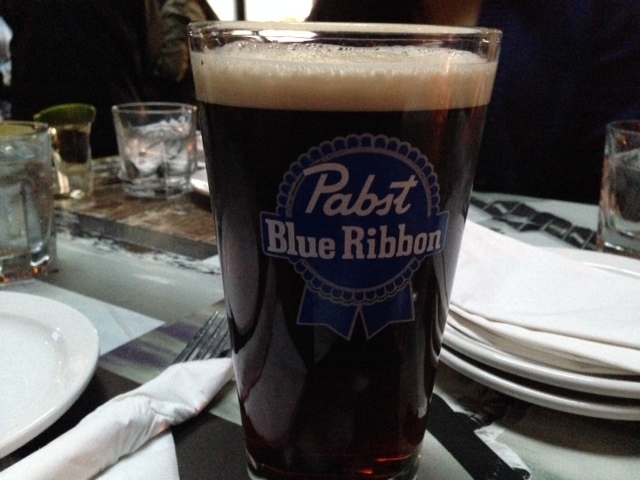 It was a dark and thick beer, with hints of chocolate but with the smoothness of vanilla. So good! 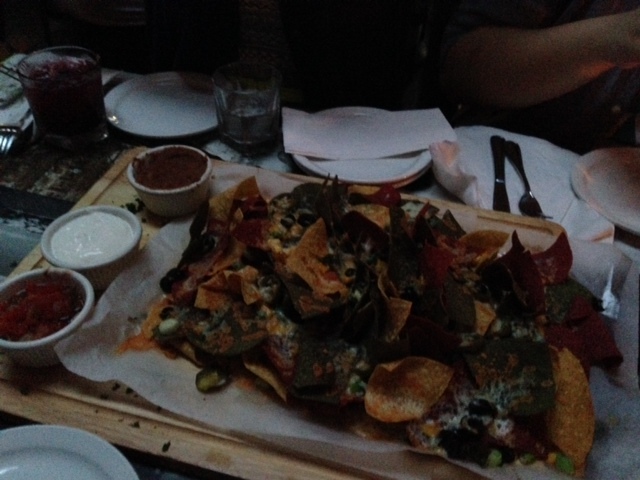 We decided on getting some nachos to share ($16 approx). These were pretty decent, and came with salsa, sour creme, and beans for dipping. I would have liked it if there was more cheese, I found a lot of the chips didn’t have any melted cheese on them. To compare it with my visit at St. Augustine’s pub, St Aug’s had more nachos but Score has more dipping sides and ingredients in their nachos. 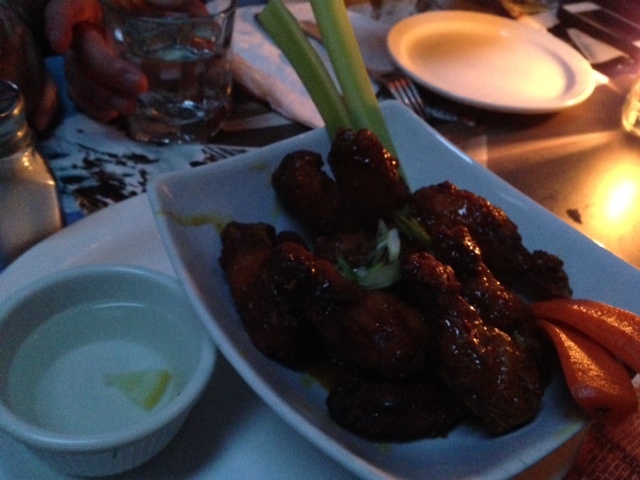 We also decided on sharing some honey garlic chicken wings ($12 approx). The chicken was hot and juicy, with the perfect amount of honey garlic. And finally, our checkmate Caesar came and as you can see, it is truly a mouth and eyeful! Ready to hear what it came with? An order of onion rings, buffalo chicken wings, a whole juicy burger, a mini slider burger, a hot dog with pulled pork, a brownie for dessert, and OH YEAH, A WHOLE CHICKEN UNDERNEATH. The drink came to $60, WHICH, before you complain and leave this page, was a good deal because you got full sized portions of all the food. If you ordered all that food individually, plus a large Caesar, you would be paying the same amount anyways. We also split the bill 6 ways so it only came to $10 each. You’re probably wondering if it was worth it. The answer is YES!!! Even though all the food was piled on top of the mighty Caesar, it was all quality food. The buns for the burger and hot dog were toasted, making it super soft on the inside. The pulled pork was so tender and juicy like the one I had at Burgers Etc BBQ House. The onion rings were perfectly crispy and tasted really fresh, as well as the crispy buffalo chicken wings. The brownie was super soft, decadent, and rich and even came with whipped cream, which melted pretty fast since the brownie was warm. The whole chicken was very meaty, and seasoned really well too! Of course, the Caesar was made well too! In conclusion, their atmosphere and service is really welcoming and attentive. Their checkmate Caesar is one of those drinks that you just have to try, put it on your summer bucket list if you have one. Their food tastes a lot better than the average pub, the quality, tenderness, and juiciness of all their meat dishes really show. I predict that this place will get a lot busier once people hear about the checkmate, so I’m glad I already got the chance to try it!